improvised compositions. 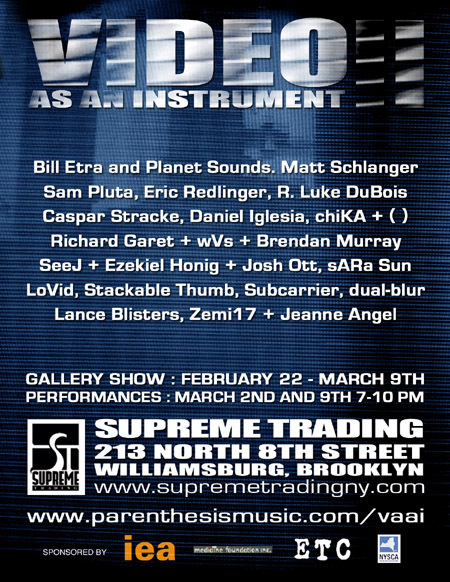 video as an instrument includes videos, installations, and performances. Bill Etra (Born March 27, 1947) is the co-inventor (with Steve Rutt) of the Rutt/Etra Video Synthesizer and Live Video pioneer. Bill is a founding member of The Kitchen. patents, some include developments for 3-D television and text-based (versus time-code based) editing of video. United States and Europe. Murray has also toured extensively throughout the United States as a solo performer and as a member of various improvising ensembles. original graphics in unique, repetitive combinations. She has performed for the Museum of Modern Art, Hammer Museum, Mutek, Decibel Festival, The Mapping Festival, the Bushwick Art Project, Asia Society and more. Eric Redlinger is a sound designer and interactive media performer. His musical background includes significant research in both extremes of the western musical spectrum. by contemporary synthesis and audio processing techniques. KeyWorx, a European Union project to develop a platform for inter-media synthesis and networked-based collaboration. Eric holds a research position at Brooklyn Polytechnic's Integrated Digital Media Institute (IDMI) and he is on the adjunct faculty of Parsons School of Design in New York City. one of contrast and contradiction, combining minimal, abstract tendencies with a core of timeless harmonics - pairing fuzzy chords with clunky and dirty "mishaps. Jeanne Angel is great on whole wheat. Extra pickles, hold the mayo. She lives in Brooklyn and spends a lot of time in front of the computer. LANCE BLISTERS: LIVE Jungle, Breakcore, Punk, and Noise performed with MIDI Guitar and Microphone, using custom software to create cutup political anthems. School of Visual Arts M.F.A. degree program in Computer Art. building custom analog and digital image and sound synthesizers currently installed at the Television Center. Matthew is currently the president of Black Hammer Productions, Inc. Networks, the American Museum of Natural History, LDEO at Columbia University, and many more. Game platforms include Game Boy Advance and PC. built Kalimbas (African Thumb Piano), mixed with computer based digital synthesized processing. Bruce Tovsky, Bruce Mcclure, Adam Kendall, Jeremy Slater, Peter Eudenbach, Zach Layton, Wolfgang Von Stüermer, Zimoun, and Aaron Kadoch. non-sense interaction objects, parasites made of code and human powered sequencing machinery. semi-regular salons, and projects everywhere. Chris also organizes T-Minus: the timelapse film festival, SINK, G33kXmas, and the NY's Visualist Salon Series. Stackable Thumb's realtime cinema performances are a slapstick of broken tools and body contortions celebrating the ridiculousness of the Anthropocene. Valued Cu$tomer and Naval Cassidy crammed onto the same stage for the first time in 8 years! manipulate video and audio simultaneously to create a kind of "video concrete" in an improvisational setting, in which media objects arethe true instruments of performance. seeds for the evolution of consciousness. Experimental Multi Media Art Festival in Berlin. and Bali . His study was concentrated on two archaic forms of gamelan, Sekatan and Slonding. through Schloss Brollin Research Labor, the James F. Robison Foundation, DTW fresh tracks, The Soros Foundation, Swiss Air, Psuedo.com and the estate of Dorthea Taylor. with composers Jolyon Brettingham-Smith, Morton Feldman, Gyoergy Ligeti, Roland Pfrengle, Luigi Nono, Wolfgang Rihm, Mathias Spahlinger and in the US with John Cage. interactive performances. WvS further lectured at IDEA'92 in Rotterdam on Internet based artists' community projects, attended the "Darmstadt Ferienkurse fuer Neue Musik"
( ) is a sound artist essentially, but also works with video and sound in performance and installation settings. ( ) uses a laptop computer and other instruments and sources to create a variety of sound and image. from the Experimental Television Center, Peer Bode from Institute for Electronic Arts, and all of the artists that made this show possible.